The unexpected resignation of President Vergil Dykstra in April 1977 came as a surprise to many, but to none more so than Vice President of Academic Affairs Dr. Robert C. Krug. Krug was appointed Acting President immediately following Dr. Dykstra’s departure having learned of his new position after returning from a short vacation. Though not an appointment he hoped to retain for an indefinite period, Dr. Krug’s brief presidency was just one of many important contributions he made to the University during its formative years. A Richmond native, Dr. Krug returned to Virginia in the summer of 1948 after a number of years of successful academic and professional work after the completion of his degree in chemistry in 1940 from the University of Richmond. Dr. Krug’s fiancé, Katherine Livingston, was a year younger than he, and they thought it best to wait to get married until after she graduated from college. That arrangement left him an extra year with which to explore his career options. Dr. Krug and Katherine were married in 1941 and moved to Columbus, Ohio where he had accepted a research assistantship at Ohio State University. After the Japanese attack on Pearl Harbor in December 1941, his project became a war research project in conjunction with the British Scientific Office and involved using hydrocarbons and mass spectrometers to analyze fuel. This project would prove to be good experience for his next professional endeavor. He received his Ph.D. in chemistry from Ohio State in 1944. After completing his studies, Dr. Krug received a job offer from the Atlantic Refining Company in Philadelphia. He and Katherine moved again, and he began work on a second war-related project, this time to develop ways to increase fuel production. Though he passed his Army physical, his work at Ohio State and Atlantic Refining kept him from being drafted. Part of the job also involved basic research regarding petrochemicals, and one of his projects at Atlantic earned the company a patent. While still at Atlantic Refining, Dr. Krug received a call from a colleague at Washington and Lee University who needed to be relieved of teaching for one year to serve as Chairman of Washington and Lee’s Bicentennial program. He asked Krug if he would be willing to fill in. Thinking that a one-year contract would serve as a good introduction to teaching, Krug accepted a position as an Assistant Professor of Chemistry, and he and his family moved to Lexington, Virginia in the summer of 1948. His next foray into the world of teaching took him far beyond Washington and Lee. Dr. Krug loved teaching chemistry, and after completing his year at Washington and Lee, he accepted a position as an Assistant Professor of Chemistry at Virginia Polytechnic Institute (VPI, later known as Virginia Tech), so he and his family moved again in the summer in 1949. The Research Corporation of America and the United States Air Force provided assistance for his work there. Dr. Krug was named Department Chair in 1957 and became one of the first winners of the W. E. Wine Award for distinguished teaching at VPI in the School of Business Administration and Applied Science. While he enjoyed his administrative work, he had a passion for the classroom and was particularly excited about the opportunity to introduce recent developments in chemistry, especially the discovery of DNA and RNA, in some of his classes. In 1965, Joseph Vaughan, Chancellor of Community Colleges at the University of Virginia, invited Dr. Krug to visit Charlottesville. The topic of their meeting was the University’s branch campus in Fairfax: George Mason College. Dr. Krug met President Edgar F. Shannon of the University as well as several deans. He then visited the campus at George Mason College, where he was introduced to Dr. Robert Reid, the director, and other staff. At the time of Dr. Krug’s visit, there were only four buildings on the campus. Plans for expansion were already well underway; though enrollment was not expected to exceed around 2,500 students. There were plans for construction of a free-standing Lecture Hall and a library. Major initiatives during Dr. Krug’s first year at Mason included hiring at least a dozen new faculty members and establishing an “academic structure” at the college. Chancellor Vaughan personally tasked him with one of his biggest duties. At the first faculty meeting in September 1965, Vaughan announced that George Mason College would become a four-year college under the University of Virginia, and Dean Krug was assigned to draft the proposal—which was due by November 15. Krug’s model for the new four-year college included four majors: Biology, English, History, and Business & Public Administration. The Business and Public Administration Program, which was unique to George Mason College, had been designed by Krug as he sought to create a solid foundation upon which George Mason College could grow. Wanting to separate the college from its contemporaries, he focused on Mason’s proximity to government agencies and the need for people with business skills to work in this sector made Business and Public Administration a good fit. The program was approved by the University at Charlottesville. In meetings with Dr. Shannon at the University Krug discussed his future plans and goals for the college. Dr. Krug placed a high value on recruiting quality faculty, and he wished to have 70% of the full-time faculty with terminal degrees in their fields by the end of 1970. Another of his goals was to complete a demographic study of the college. Krug felt it was particularly important to consider the size of the school and how much room it would eventually need for growth. His insight did not go unnoticed. A commission was established to purchase several hundred acres of land in the name of the University of Virginia in order to lay groundwork for the geographic expansion of the campus. The “academic expansion …was well underway.” The construction of the buildings discussed at Dr. Krug’s interview in 1965 was now in progress: The Lecture Hall and the first building of the library were finished in December 1967 (students helped to transfer books to the new location and were rewarded with a free lunch). Exploring the college’s demographics was important to Dr. Krug, especially because of his recruitment efforts. During the early 1970s he met with members of the National Urban League. The group suggested to Krug that Mason did not have a sufficient number of black students and faculty. This meeting led to discussions about the roadblocks faced in minority recruitment: "It [was] very difficult for George Mason recruit black faculty when they [could] get a higher-paying job at a more prestigious university like Harvard,” recalled Dr. Krug. Both parties agreed that there existed a need to diversify the faculty and student bodies. Dr. Krug thought that the Bachelor of Individualized Study program, offered at the North Campus, might increase diversity, but it brought mostly changes in student age and interest, not necessarily race. Robert Hawkes, the Director of Extended Studies, introduced courses into minority communities in an attempt to reach out to students who might not ordinarily come to George Mason. This was a positive first step toward increasing diversity, but major strides were not made until the presidency of Dr. Vergil H. Dykstra. George Mason College had been accredited as part of the University of Virginia, but the University thought that it was important for the college to be accredited in its own right due to its academic and geographic expansion. The process would require two years of intensive self-study. Chancellor Thompson asked three senior faculty members each to chair, but all three refused because of the workload. Dr. Krug consented to lead the project, and he was named Director of the Self-Study. The report, another of Dr. Krug’s major contributions to the College’s growth, was to be completed in July of 1970. When George Mason College became an independent university in April 1972, Dr. Krug became Provost, then Vice President of Academic Affairs. When Dr. Dykstra, who had served the new university since 1973, left in April 1977, Dr. Krug became Acting President. He accepted the position with the stipulation that he did not wish to remain President; he would only fill in until a new president was chosen. His official duties began on April 1, 1977. Dr. Krug’s most important goals during his short term as president were to effectively define and manage the budget and to oversee the emergence of a law school in Arlington. The State Council of Higher Education for Virginia did not support a law school connected to George Mason University during Krug’s term, but the issue was eventually resolved after, in Krug’s words, “Til Hazel later won over the Council” by skillfully brokering the merger with the International School of Law in 1978. 1978 was a major budget year for the new university; one of the biggest disappointments of Dr. Dykstra’s term was that small budgets had not allowed the University to grow and that no new construction had been approved during his term.Henry Adams, Vice President for Business Affairs, assisted Dr. Krug with planning. Adams succeeded in raising the salaries of classified staff and helped Krug develop a budget which allowed for new building expansion. Dr. Krug authorized the creation of a new psychology research building, oversaw the completion of the first on-campus housing, and worked to establish a computer system for the university. Dr. Krug wanted to prepare the university for the future, and he believed that accomplishing that goal entailed developing a symbiotic relationship with the Northern Virginia and greater-Washington, D.C. areas: “The need, as I see it, is for GMU to move beyond the boundaries of the North Campus and the Main Campus,” said Krug in 1977. The realization of that objective meant serving the surrounding area and utilizing the resources it made available. Dr. Krug wanted the graduate program to grow and pushed for the expansion of the Nursing, Fine Arts, and Business and Public Administration programs. He also wanted to explore the possibility of offering engineering and creating an East Campus in Arlington. Dr. Krug was a candidate for early retirement, so a search for a successor was in full swing at the end of his appointment. George Johnson, Dean at Temple University, was selected as President and slated to begin June 1978. He asked Dr. Krug to stay on for one last year as Vice President for Academic Affairs. 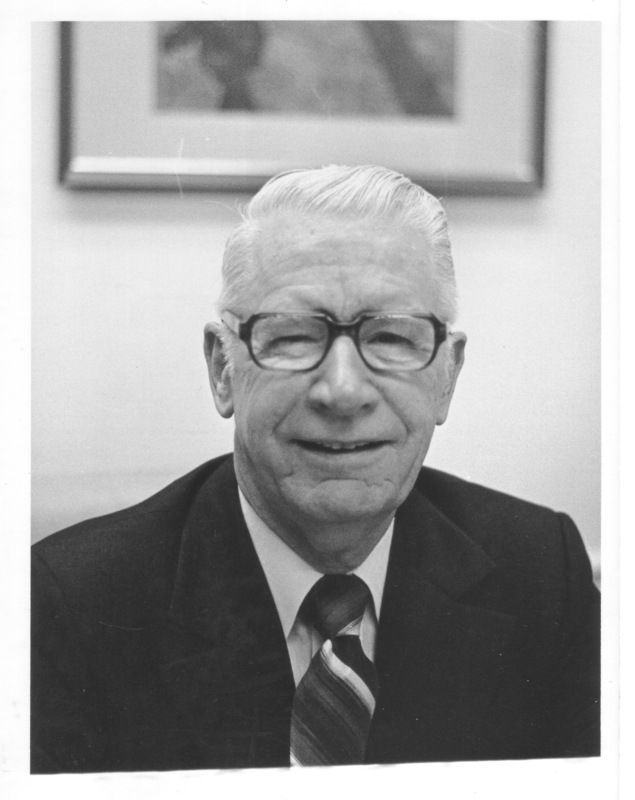 That same month, Dr. Krug was honored to learn that the South Building would be named for him, and the Board of Visitors retroactively named him President, rather than Acting President, from April 1, 1977. In his final year, he served once again as Vice President of Academic Affairs and followed a ten-year academic plan that had been developed by Dr. Ralph Baxter, who had taken Krug’s place while he was Acting President. After teaching chemistry for a few more years, he enjoyed a relaxing retirement with his wife and got into the cattle business. Dr. Krug passed away on October 29, 2006, but his contributions to George Mason have left a lasting legacy. Browse items pertaining to Dr. Robert C. Krug.